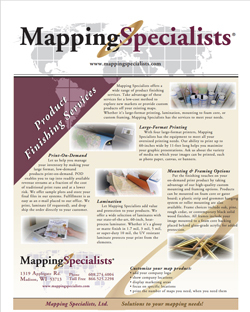 Let us help you manage your inventory by making your large format, low-demand products print on demand. POD enables you to tap into readily available revenue streams at a fraction of the cost of traditional print runs and at a lower risk. We offer sample plots and store your final files in our systems. Fulfillment is as easy as an e-mail placed to our office. We print, laminate (if requested), and drop ship the order directly to your customer.